This book is about body language: signals we send and receive, messages we transmit and decipher, and “statements” we make about ourselves nonverbally. Body language is the most primitive system of communication that we share with other species in the animal kingdom. We also use it in the board room and the salesroom to great or little effect. It is the language that we all speak regardless of background or upbringing. It is in our ‘DNA’: it is a part of our human nature, the very stuff of communication. In this book we seek to clarify a few issues. Firstly, we pose and answer the question what does it entail to communicate via body language. Secondly, we deal with the issues of how body language can be used and, regrettably, sometimes abused, to communicate. There is much confusion (and dare we say nonsense) about how to interpret nonverbal signals. Finally, we choose to concentrate on practical applications of these facts and observations to the world of work and business. Body language is important at work from the selection interview to the farewell speech. 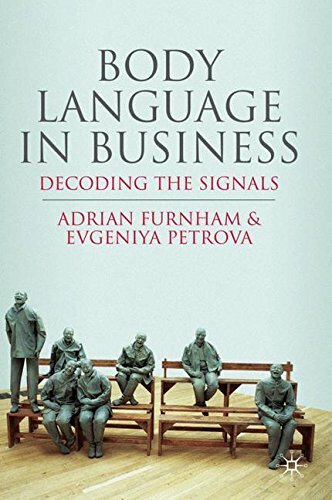 Nonverbal communication is also the essence of political propaganda, PR, marketing and advertising, and understanding of how these silent signals work can be a crucial asset to business as well as to consumers’ education. This book will give you practical tips and advice about how to become better and more successful in business by reading and displaying the right body language. View More In Strategic Planning.